The Surface Dial is built for content creators. Sometimes versatile tools just aren’t enough. The keyboard and mouse’s flexibility have made them a PC mainstay for decades, but Microsoft’s introducing a focused, more artist-centric new input device dubbed the Surface Dial to accompany its new Surface Studio all-in-one PC. The Surface Dial’s a hockey puck-like device designed to work in conjunction with Microsoft’s Surface Pen. The Dial doesn’t appear to have any buttons of its own; placing the device on the Surface Studio’s ultra-slim display brings up a contextual interface wheel with an array of options around the Dial, which you can cycle through by turning the device. In on-stage demonstrations, the Dial displayed brush tools and other related options when used with image-editing software, and an analog rewind tool to display and hide handwritten notes in Office. 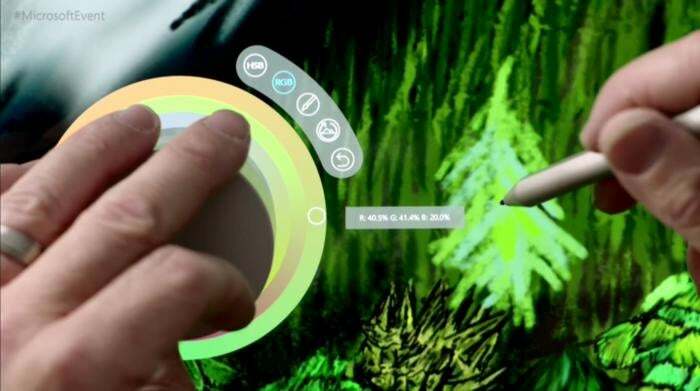 You have to imagine Microsoft’s new input will include native support for Windows 10’s new Paint 3D app, as well. Microsoft’s Surface Dial in action on the Surface Studio all-in-one. The Surface Dial can be used when it’s not directly on the display as well. Activating it prompts a virtualized version to appear on-screen, with various options available depending on what you’re doing. Scrolling, zooming, and navigation features are all included, and you can even adjust system volume and display brightness with the device. 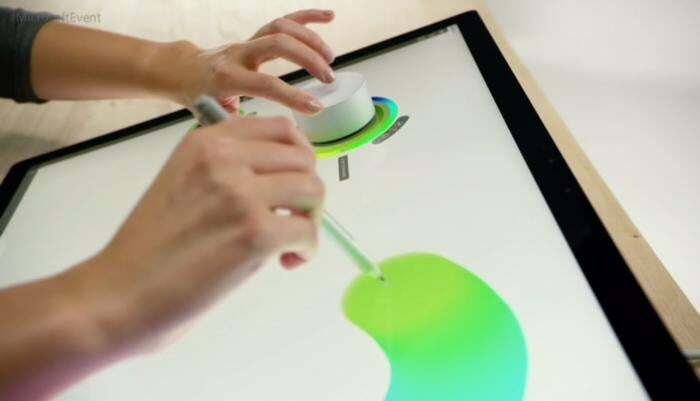 Support for the Surface Dial is baked right into the Windows 10 Creators Update, as well as the Surface Studio, Surface Pro 3 and 4, and Surface Book. Update: The Surface Dial is available to preorder now for $100.